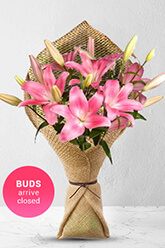 These pink Asiatic Lilies are absolutely gorgeous and are sure to brighten any face or room.Vase not included however; we recommend adding a Standard Vase to add to the element of surprise.Lilies may be sent closed/partially closed in order to prevent damage and to last longer. My daughter loved her flowers. I ordered flowers for my sister after the passing of our Mother. The flowersare bbeautiful, however they were delivered two days after they were supposed to be. I ordered lilies from the UK for my daughters birthday, they were outside her house when she got back from work as planned & she loves them. Delivery was perfectly timed. The choice of flowers recommended was excellent...and best of all , the wife was so happy..and thrilled when the flowers bloomed within the next few days. Thank you. mum was thrilled to receive the flowers on the day itself.